James Fisher White, 94, of Frankfort, KY died at his home on December 25, 2018. Born in Georgetown, KY, he was the son of the late James Stamper White and Jessie Bailey Griggs. He was a 1942 graduate of Garth High School in Georgetown, KY.
For more than 40 years, Jim was in the grocery business, owning supermarkets in Georgetown and Frankfort, KY. 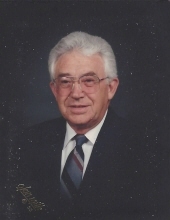 He was an Army veteran of WWII, and was a longtime member of the First United Methodist Church of Frankfort. He was a member of the Kiwanis Club, American Legion and VFW Post 4075. He was married to Evelyn McFarland White. Survivors include his “four boys”, Stephen (Linda) of Columbus, OH; David of Frankfort; Randy (Carol) of Sellersburg, IN; and Douglas of Lexington, KY; three grandchildren and three great grandchildren. Visitation will be Monday, December 31 from 10:00 am to Noon at Tucker, Yocum, Wilson Funeral Home, 320 W. Main Street, Georgetown, KY. Funeral services will follow immediately at noon. To send flowers or a remembrance gift to the family of James Fisher White, please visit our Tribute Store. "Email Address" would like to share the life celebration of James Fisher White. Click on the "link" to go to share a favorite memory or leave a condolence message for the family.